Goldman Sachs special education bonds are in the ESEA reauthorization. Who knew that the U.S. Senate reauthorization of ESEA (No Child Left Behind) contains an amendment adopted by the Senate from Sen. Orrin Hatch (R-Utah) that adopts the Goldman Sachs concept of paying investors for any child that avoids special education? Sen. Hatch, has been working in Congress to allow other states to replicate this success. In fact, the Hatch amendment to the Every Child Achieves Act will allow states to implement Pay-for-Success initiatives. The federal government helps fund many education programs, but Washington seldom knows what’s best for states or local communities. By allowing federal funds to help finance Pay-for-Success initiatives, this amendment will provide states with the flexibility they need to adopt effective, impactful strategies to improve education and save taxpayer money. The amendment passed as part of the Senate’s education bill this summer and awaits action in the House of Representatives. Actually the U.S. Senate and House have passed different versions of ESEA and we are faced with a possible Conference Committee between the Senate and House to compromise the two bills. This possible compromise may not happen as the two bills are very different, and the upcoming departures of House Speaker John Boehner (one of the original authors of No Child Left Behind) and of Secretary of Education Arne Duncan may lessen the pressure to pass a new ESEA. But we need to let every national organization that we belong to know that we oppose the concept of paying Goldman Sachs and other investors for every child that avoids special education (what Sen. Hatch calls Pay-for-Success). By the way, Sen. Hatch’s op-ed specifically mentions Goldman Sachs. Where’s the savings for taxpayers? Show me the money! Show me the benefit to students with special needs. I don’t think I am understanding this. Big business invests in programs to address special needs students and get a kick-back for each child they keep out of special education? I’m confused. No. You’re not confused. A Wall Street firm buys social impact bonds (sibs) to fund a public program, like recidivism at Rikers Island in NY, with money backed by a philanthropy like Bloomberg or Pritzker. But it doesn’t function like a normal bond which pays back at a rate established by the market. It pays back the bond holder (Goldman Sachs in the case of special ed) based on a mutually agreed upon measure of success. In the case of special ed, how many students are moved out of special education programs. If flies in the face, probably no need to explain, of determining need for services based on the needs of the individual child. In which case, success would be measured by whether the child was receiving interventions and services and individually assessing what those interventions and services are and if they are working, “working” not being defined by whether they are no longer receiving them. Nothing and no one should hav any say in determining when a child exits special education except his IEP team. That decision can not be rushed by the “urgency to cash in”! This is horrific. Just returned from a choppy cruise. At no time did I feel nauseous or regurgitate. But reading & digesting this information makes me want to vomit. 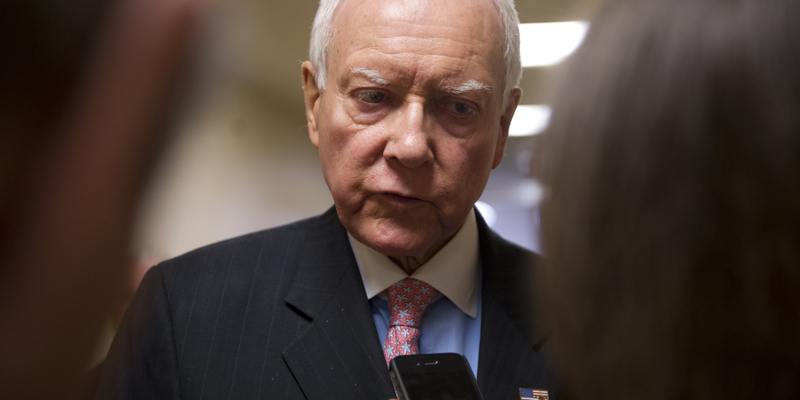 Do you think Orrin Hatch has ever received any gifts or favors from Goldman Sachs? PreviousTony at the Red Line Tap. NextThe Trib is wrong again. Cutting services isn’t budget reform.